Most drivers have had this experience: it’s late at night and out of nowhere an animal darts across the road. Thousands of animals are hit every year in California, taking a toll on both wildlife and drivers. Nationwide, wildlife collisions are estimated to cause $1 billion in damage. Several western states have built infrastructure to help wildlife cross under highways safely—projects known as “wildlife corridors.” Some experts say that while California officials know about the extent of the problem, the state is way behind in solving it. The dangers have recently become clear in the Santa Cruz Mountains, where mountain lions are crossing Highway 17, a winding, four-lane highway. The population is being studied by the Santa Cruz Puma Project, run out of the University of California-Santa Cruz. On a sunny, late-spring afternoon, field biologist Paul Houghtaling meets up with Dan Tichenor, a volunteer from California Houndsmen for Conservation, and his hound dogs. 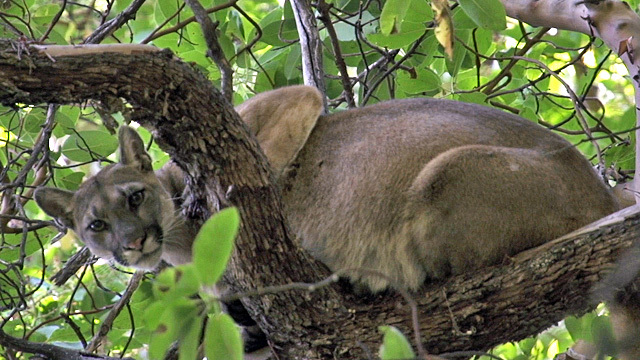 They tracked the scent of a mountain lion, now in a tree to avoid the barking dogs. Houghtaling intends to put a radio and GPS tracking collar on the lion. The data will feed into a five-year project to document mountain lion movements in the area and study how they live around people. Four other lions have been killed on Highway 17 in the last few years. Houghtaling says the data show that most of them are trying to cross the highway at the same places, which makes those locations good candidates for wildlife corridor projects. The Bay Area’s highway network fragments wildlife habitat, either forcing animals to cross freeways or isolating them in “islands” of habitat. Scientists say connecting habitat will be increasingly important with climate change, as animals and plants need to move with shifting conditions. A recent effort by conservation groups identified 14 places where preserving land would connect the Bay Area’s open spaces. Citizen scientists have documented around 7,000 dead animals on Bay Area roads over the last four years, which Shilling says represents a fraction of the total number. 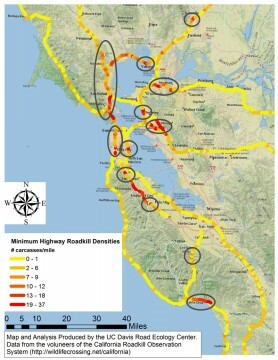 Bay Area wildlife collision hotspots (click to enlarge). Another road-kill hotspot is Interstate 280, a commuter favorite heading south out of San Francisco. The multi-lane freeway opens to rolling, grassy hills on either side. Collisions at freeway speeds are often fatal for the deer, and sometimes for the driver. Every year, drivers hit about 40 deer along I-280, but Shilling found some deer are going under the freeway through culverts and underpasses. 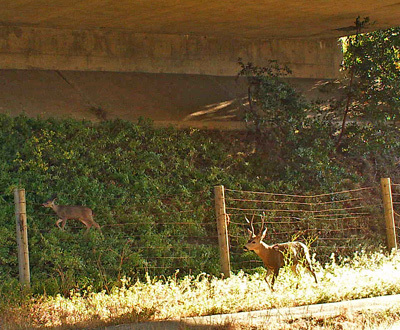 In a report he’s drafting for Caltrans, Shilling recommends putting up wildlife fencing that would funnel deer to the underpasses, keeping them off the freeway. Those underpasses could be made more attractive to wildlife by creating separate pathways for people and animals to use. Animals tend to avoid areas that are heavily used by people. Building fences can be expensive—up to $100,000 per mile—but Shilling compares that to cost of collisions from vehicle damage and injuries. Other western states like Colorado and Montana have put in fences and built underpasses on major highways, and the projects have proven effective. Haus says Caltrans is building a culvert for wildlife near Napa as Highway 12 is widened. But that’s only one of five projects being built or designed specifically for wildlife in the Bay Area that Caltrans could name. 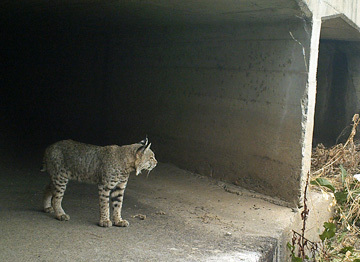 A bobcat uses an existing culvert under Highway 152, the site of a wildlife corridor research project by the Nature Conservancy (Photo: The Nature Conservancy Pajaro Connectivity Study). Haus says his district has commissioned a report from UC Davis about Bay Area collision hotspots. “I believe there’s a lot more that can be done in California to make habitats more connected for wildlife, particularly across roads and other kinds of barriers,” says David Wright, who works on the Resource Assessment Program at the California Department of Fish and Wildlife. “I think that if we starting thinking about every project as it comes up and trying to make sure that we include something that improves connectivity for wildlife, then I think we’ll start seeing better habitat and more wildlife in our state,” Wright says. Back in the Santa Cruz mountains, Paul Houghtaling loads his rifle with a dart to sedate the mountain lion in the tree above us. He takes aim and the dart hits square in the thigh. The mountain lion leaps down and runs by at full speed. He catches up with her (turns out it’s a “she”) as she’s failing asleep under some bushes. Houghtaling takes her vitals and fits her with a radio collar, giving her the name “38F” as the 38th mountain lion in the study. Things could be looking up for the Santa Cruz lion population. Local land trusts, including the Midpeninsula Regional Open Space District, the Land Trust of Santa Cruz County, and the Peninsula Open Space Trust, are working with another Caltrans district, District 5, to improve highway 17 by expanding culverts and putting up fencing in two locations. The group is using cameras to study animal movement in those corridors and is currently applying for state funding to complete the project. That would be a great idea if these power plant will open on the said time.it will be very beneficial according to the place where it was built.Hopefully it will be embrace by people as their source of energy not as an alternative. It doesn’t have storage? Why don’t they add storage? Are they going to have multiple plants with a centralized storage for all of them? I don’t understand why they couldn’t just add storage like, I don’t know, underneath the panels or something.